While “carrying an SLR and laptop” aren’t usually considered military ops, at least according to the marine I know (Hi Chris! ), the Naneu Pro Sierra bag is quite an original. 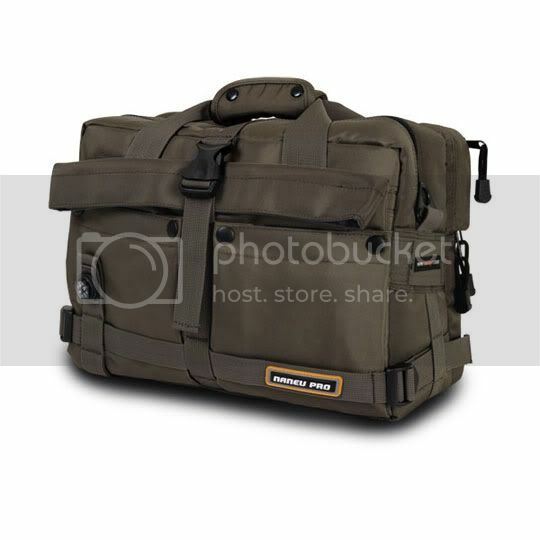 Designed to hold both a camera and a laptop, the bag is compact and well-proportioned, allowing a 12-inch Powerbook and my Rebel XT to cohabitate like college virgins discovering the first taste forbidden love. I tried this on a few flights and discovered that as a standard SLR and laptop case, the Sierra is perfect. Inserts keep things safe on the SLR side and there’s just enough room to slide in the laptop without fear of damage. Unfortunately, when I took out the padded inserts and tried to use it as a carry-on for books and magazines, I discovered some limitations. The Sierra is chock-full of pockets and many of them couldn’t quite hold a larger magazine – Marie Claire was HUGE last month – without having things hang out over the edge. A few books also overwhelmed the laptop pocket. However, if you need a bag that does what it advertises – safely totes your camera and laptop sans interaction – this is a winner. Who is this for? The camera geek on the go, plain and simple. Although the Lima does include a compass on one of the straps, your best bet is to avoid shock and awe tactics and instead focus on carrying your camera and smaller laptop safely through the Tampa airport. $89.99 on Naneu’s homepage.